The following is a summary of the major sound changes affecting vowels in chronological order. For additional detail, see Phonological history of Old English. * Ae /eː/, /jeː/ is the adjectival form used before nouns. 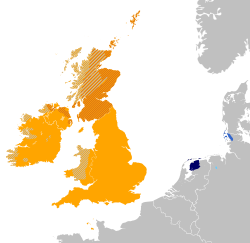 Ingvaeonic, also known as North Sea Germanic, is a postulated grouping of the West Germanic languages that comprises Old Frisian, Old English and Old Saxon. It is not thought of as a monolithic proto-language, but rather as a group of closely related dialects that underwent several areal changes in relative unison. The grouping was first proposed in Nordgermanen und Alemannen (1942) by the German linguist and philologist Friedrich Maurer (1898–1984), as an alternative to the strict tree diagrams which had become popular following the work of the 19th-century linguist August Schleicher and which assumed the existence of an Anglo-Frisian group. ^ Original meaning was "relative" which has become "brother or sister" in English. ^ Hammarström, Harald; Forkel, Robert; Haspelmath, Martin, eds. (2017). "Anglo-Frisian". Glottolog 3.0. Jena, Germany: Max Planck Institute for the Science of Human History. ^ Robert D. Fulk, “The Chronology of Anglo-Frisian Sound Changes”, Approaches to Old Frisian Philology, eds., Rolf H. Bremmer Jr., Thomas S.B. Johnston, and Oebele Vries (Amsterdam: Rodopoi, 1998), 185. ^ Also known as Anglo-Saxon. ^ Some include West Flemish. Cf. Bremmer (2009:22). ^ For a full discussion of the areal changes involved and their relative chronologies, see Voyles (1992). ^ "Friedrich Maurer (Lehrstuhl für Germanische Philologie - Linguistik)". Germanistik.uni-freiburg.de. Retrieved 2013-06-24. Friedrich Maurer (1942), Nordgermanen und Alemannen: Studien zur Sprachgeschichte, Stammes- und Volkskunde, Strasbourg: Hünenburg. Wolfram Euler (2013), Das Westgermanische [subtitle missing] (West Germanic: from its Emergence in the 3rd up until its Dissolution in the 7th Century CE: Analyses and Reconstruction). 244 p., in German with English summary, Verlag Inspiration Un Ltd., London/Berlin, ISBN 978-3-9812110-7-8.